Once at a fishing hole, the next step is to choose the type of bait. Using the correct type of bait for that water type will yield more success and prevent the appearance of Used Bait. If you get one, it means you are using the incorrect bait type for that fishing hole. While fishing, you also have a chance to reel in a Wet Gunny Sack instead of a fish, which contains miscellaneous crafting materials such as trait materials, tempers, style materials, or enchanting runes. When a fish is on the line, the float will sink into the water and your character will pull on the fishing rod. Activating it in time will bring in a fish. Every fishing hole has 15 catches, except ones in the Imperial City, which have 30. 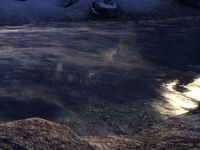 It is possible to come across fishing holes with less catches, because players can abandon a fishing hole before it is emptied, leaving the rest of the catches for later players. On rare occasions, a fishing hole can respawn shortly after having been emptied, or even sometimes while you are currently fishing out of it. When you catch a common fish, you are able to fillet it if you use it from your inventory. Doing so gives you a guaranteed Fish provisioning ingredient, and also has a very small chance of yielding a Perfect Roe, one of the provisioning ingredients used to brew Psijic Ambrosia (as well as Orzorga's Smoked Bear Haunch). There are four main types of water sources that you can fish from. 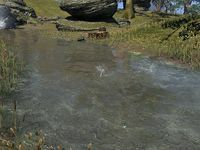 As detailed in A Guide to Fishing Tamriel, certain types of bait work better in certain types of water, and different common fish are caught depending on the water type. A fifth type of water, "Spawning", is quest-related and isn't usually encountered. Foul water fishing holes can be found in fetid, murky pools of water such as sewers, swamps and near decomposing corpses. River fishing holes can be found in moving bodies of fresh flowing water that drain into a lake or the ocean. Lake fishing holes can be found in still bodies of water with deep holes or overgrowth. Ocean fishing holes are almost anywhere on the coast. 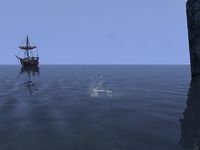 Coastal cities, such as Ebonheart and Skywatch, have docks with fishing holes. Spawning fishing holes are related to specific quests, as detailed below. 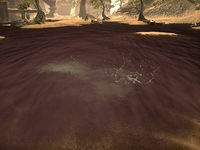 Mystic fishing holes are only found on Artaeum, and they function identically to Ocean fishing holes. 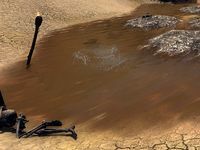 Oily fishing holes are only found in the Clockwork City, and they function identically to Foul fishing holes. Bait can be obtained by various methods, as detailed below. Bait items can be stored in Craft Bags and are categorized as Provisioning materials, even though most bait isn't used in any Provisioning recipes. In Clockwork City, instead of the usual foul water fish you will catch either Clockerfish or Typical Barb. as it is not optimal for any water type. These fish can only be caught at specific fishing holes as part of the related quest. Aside from Used Bait, nothing else can be caught at these fishing holes. Pyandonean Bottle — a container found only in Summerset that may contain a page from the Crafting Motif 64: Pyandonean book and/or units of Sea Serpent Hide. Wet Gunny Sacks — may contain a weapon, piece of armor, crafting materials, or other items. Increases Magicka and Stamina Recovery by x and grants keen eyes toward fish. Fish Eye is a status effect gained by drinking Hissmir Fish-Eye Rye. In addition to a level-scaled buff to Magicka Recovery and Stamina Recovery, the drink grants "keen eyes" similar to the Keen Eye perks available for crafting material nodes. With this status effect, fishing holes will appear to glow, and the water type will be displayed when you approach (e.g. "River Fish", "Spawning Fish", etc). While the glow effect may be useful in highlighting fishing holes, the secondary effect is largely obsolete since water types are now automatically displayed even without this drink active. Increases Max Health and Max Magicka. Additionally, fish may be drawn to you. Lure Allure is a buff gained by eating Artaeum Pickled Fish Bowl. In addition to a level-scaled increase to your maximum Health and Magicka, the food causes fish to be attracted to you. This shortens the time needed for fish to bite, increasing the rate at which you can reel in fish and other items. There are many achievements associated with fishing. Every zone except the starter islands has 12 rare fish you can catch. Catching all of the rare fish in a zone will give you that zone's achievement. If you get all of the major zone achievements in one alliance, you'll receive another achievement for that alliance. Get all three of those, along with the starter island achievements and the separate ones for Cyrodiil and Coldharbour, and you'll receive the rare Master Fisher achievement. 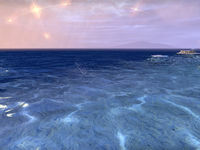 Note that the fish on the starter islands are not necessary for the alliance fishing achievements, but they are necessary for the Master Fisher achievement. Completing the Master Fisher achievement grants the title "Master Angler". Craglorn Angler and the DLC achievements are not needed to earn the Master Fisher achievement. Fish Boon Angler is a quest-related holiday event achievement. Occasionally you will receive the message "You cannot fish in Werewolf form" while attempting to fish. This can be fixed by relogging. 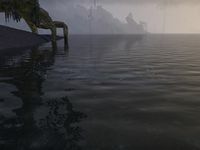 Sometimes while fishing at a lake in Auridon, you will catch both a Barbel and a Zebra Oto, the latter of which is a rare fish from The Rift, and will get credit for both. Some very few fishing holes will only give Used Bait. 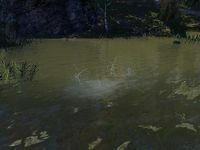 Sometimes while fishing in the fishing hole under the bridge to the closed Green Emperor Way District in the Arboretum District, you will catch a Sewer Eel, a Cyrodiil foul water fish. ? Guts are a quest item in The Witchmother's Bargain. This page was last modified on 27 November 2018, at 15:49.